allow us to upgrade our collection without incurring the additional cost of purchasing pots. Indoor display stands of all sizes are also needed. The Huntington has a collection of books on bonsai used for research by The Huntington staff. Golden State Bonsai Federation general fund and are used for the collection. the GSBF Collection general fund. contact us by using the contact form. All donations will be accepted. 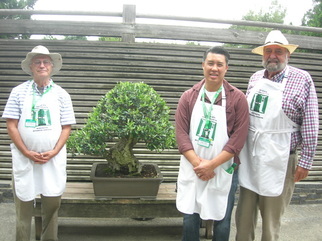 The Bonsai-A-Thon is held each February and is the major fund raising event for the GSBF Collection at The Huntington. The event is put on by the GSBF Collection at The Huntington Committee, with local clubs that hosting. Volunteer help is always needed and there are many ways to participate. You do not have to volunteer all day for both days, any help you can give is appreciated. If you have any questions, or wish to volunteer, please contact us by using the contact form. 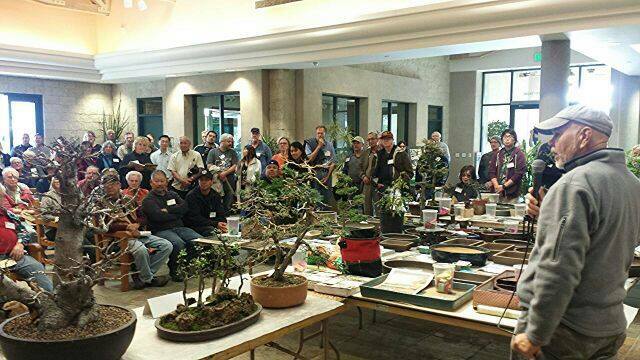 The First Thursday/Saturday Program was established by Golden State Bonsai Federation to supply bonsai garden specialists to The Huntington on the first Thursday and first Saturday of each month. The Huntington offers free tickets to the library and gardens on the first Thursday of each month, which is one of the busiest days for The Huntington. The GSBF started the First Thursday Program over 15 years ago. As a bonsai garden specialist, volunteers interact with visitors, answering questions on bonsai, bonsai classes and local clubs. It is like working a club show, only at The Huntington on the first Thursday/Saturday of the month. There are no requirements to be a volunteer, other than a love for the art of bonsai and an interest in promoting this hobby. The program is so appreciated by The Huntington, when GSBF asked to expand the program to the first Saturday of the month, GSBF was given an immediate go ahead. As a bonsai garden specialist, you can park inside The Huntington behind the bonsai courts on the day you volunteer. As added bonuses, spiffy GSBF Huntington aprons and really neat Huntington Gardens' Volunteer Badges are provided for all those participating in the program. How cool is that!